Chicago Marine Canvas offers boat canvas tops in Chicago for Aft Covers, Bimini Tops, Dodgers, Cockpit Covers, Convertible Tops, Enclosure Panels, Fly Bridge Bimini Tops, Fly Bridge Covers, Mooring Covers, Sail Covers, Windshield Covers and more. All of our quality custom canvas solutions utilizing state of the art technology. By elimination added costs and time involved with templating or taking hand measuring, we’re able to get you a beautiful canvas enclosure that is tight fitting fast! We also partner with the best canvas brands such as Sunbrella, Stamoid, Sea Mark, Herculite, Weblon Regatta, Strataglass and Crystal Clear 20/20. This combination will give you a premium boat canvas top or enclosure that will last for years. 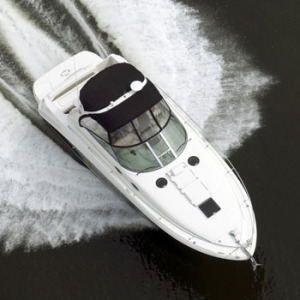 Below are some common types of boat canvas tops and enclosures found on yachts and boats in Chicago. We’d love to hear from you and discuss you boat canvas project, please contact us today. Bimini Tops: These type of boat tops can be found on many different styles of boats and of different sizes too. They are supported by stainless steel or aluminum framing that can be easily raised and lowered. Sometimes they are also supported by straps to stabilize the bimini while underway. Bimini boat tops are great for shade and depending on the customers needs come with forward, aft and side panels that are typically fabricated with isenglass for viability. The Bimini top canvas is secured to the framing by zipper and can easily be removed during storage or for cleaning. Dodgers: These boat canvas tops in Chicago are typically found on smaller crafts. Dodgers are located on the forward area of a boat and are meant to reduce spray while underway. They are rarely included with the purchase of a new boat and are mostly an aftermarket boat top. They can also be made for center console style boats which then provide permanent storage for items when moored. Dodgers come in various sizes and designs and are 100% based on the needs of the boater and boat. Similar to a Bimini Top, they are constructed of stainless steel or aluminum and typically can collapse which is especially practical while trailering you boat. Dodgers are a low cost investment that can increase your satisfaction of your boat all summer long. Convertible Tops: A convertible top is commonly found on a cruiser style boat as pictured where there is not a fiberglass hardtop covering the cockpit area. It’s the perfect boat top to protect the driver from the weather or provides shade on those sunny days. Typically it can be folded back into a position where it mimics a type of radar arch. It also is supported by stainless steel of aluminum framing with zippers securing the fabric to the frame. It’s secured the windshield commonly with snaps and at Chicago Marine Canvas we like to use a product called Xtreme Seal in this area to provide a three point contact seal between the canvas and windshield. Enclosure Panels: Commonly referred to as a camper top, full boat enclosure boat tops extend from the cockpit area of a boat all the way back to the aft. These are also common boat canvas tops in Chicago and can be fabricated many different ways in conjuncture with convertible or bimini tops. Enclosure panels almost always have a mix between canvas and eisenglass windows which really depends on your level of privacy required. Another option is to add zippers to you windows and many a screen or two for fresh air. Most and more boaters are moving to full eisenglass window enclosures in the aft for maximum visibility while underway in inclement weather. This is all a personal preference which is decided by you and how you plan on using your boat and boat top. Fly Bridge Bimini Tops: Very similar to a Bimini Top, a Fly Bridge Bimini is located on, your Fly-Bridge. There are only found on convertibles and almost always have enclosure panels surrounding then that can easily taken on or off with zippers and snaps.